Whatever we attribute it to, there has been a noticeable migration from religion and to spirituality in the Western World. More recent we’ve witnessed significant numbers, particularly within the African American community, abandoning dominant religions to explore various spiritual practices, more specifically Indigenous African Spirituality (IAS). IAS encompasses native beliefs existing on the continent of Africa prior to the Christian and Islamic Colonization. My personal journey began in 2009 and I found myself struggling to navigate the convoluted information I was finding despite my Nigerian heritage. The frustration of hitting dead ends at every turn coupled with the confusion of having my father vehemently refuse to support my intended journey was almost too much to cope with. It wasn’t until much later that he would reveal the cause of his hesitation. He had witnessed his father’s torment, ridicule, and later banishment because of his refusal to convert to Christianity and didn’t want to see his child endure the same social execution. As much as I understood my father’s hesitation, I fully understood my grandfather’s opposition. It became quite apparent to me that it wasn’t just the knowledge of IAS that I was after, it was the freedom. Although I never regret my decision to exchange my angels for ancestors, I struggle daily with the ignorance and fear that surround my beliefs. Finding it easier to avoid talks about religion altogether just to dodge the conversation that begins after the gasps end. With all the misinformation that’s been propagated about IAS, it should come as no surprise that very little is known about its actual practices. So today, to spark much needed conversation, I’ll be tackling 6 common myths about IAS. Whether consciously or subconsciously, many still think of Africa as “The Dark Continent”. A term coined during the “Scramble of Africa”, an orchestrated division, occupation and pillage of Africa which began in 1884 at the Berlin Conference. While the West seemed to have a great fixation with the complexions of indigenous Africans, and still very much do, there was also a deep preoccupation with their Spirituality and cultural practices. Commonly depicted as having a simple yet complex and mystifying makeup, Africans were thought to be part simple minded beast of the jungle, part self-learned wizard. It is not until this aggressive exploration of Africa that we began to see the constant vilification of indigenous culture. It is through these Western accounts that we see the Creator painted as a dark, demonic, oppressive force. And while many of us thoughtlessly accept this narrative, contending that no benevolent God would force people to endure the atrocities that Africa has faced, this idea couldn’t be further from the truth. IAS varies as we travel from one end of the continent to another, but 3 concepts remain static throughout all documented indigenous spiritual systems. The first and most important being the belief in a single Supreme Being or Creator, an individual omnipotent Source that is both unique and venerable. To put in plainly, IAS is as monotheistic as they come. Prior to the arrival of Christianity, we see no physical depiction of the Creator and hear no mention of a gender designation as the Creator has always been believed to encompass both energies. The idea that the Western world introduced monotheism to Africa is a dangerous myth that should constantly be confronted and corrected. Society has come to associate polytheism with pagan worship, gross lack of social advancement and dangerously uncivilized belief systems. These associations are then used to imply that the introduction of Christianity was somehow a positive thing. As a result, we grapple with the widely held belief that Christianity civilized Africa, introducing them to concepts which had existed long before Western interference. With that, it’s safe to say that Myth #1 is false. This is a commonly held misconception that has shaped much of the modern world’s idea of what IAS looks like when physically manifested. The depiction of naked jungle inhabitants dancing around a bronze serpent to the unpredictable rhythm of a bongo drum is something straight out of a movie. Unfortunately, images like these have become somewhat synonymous with indigenous spirituality. An idol is an image or representation of a God used as an object of worship. By this definition, every member of a dominant religion would also be guilty of idolatry. For Christians, there is the crucifix. For Muslims, the equivalent would be prayer beads. The aisles and corners of Catholic churches are riddled with pristine porcelain sculptures of the Virgin Mary and more well-known saints. A follower of an indigenous religion may carry charms or amulets or any of the aforementioned, a testament to the flexibility and inclusivity of IAS. But truth be told, Christians aren’t praying to the crucifix itself, neither are Muslims asking for favor from the actual prayer beads which would equate idolatry. History tells us that every documented spiritual or religious system is known to have identified symbolic tools through which to connect to a higher source. The desire to feel engagement on a spiritual level is something that people of all faiths share, IAS is no different. Myth #2 is also false. Veneration of the dead, sometimes referred to as ancestor worship, is simply defined as expressing profound respect or reverence for deceased relatives. When we examine religious doctrine from around the globe, we find that this is a customary practice in many cultures, including American culture. Ancestors are long thought to act as mediators between the living and God the creator, offering guidance and wisdom throughout one’s life in exchange for devotion. One of the most common examples of this is the funeral. That’s right! Funeral rites can be seen in every culture ever documented. While some specifics vary, each cultural group has been documented designating a place for the placement of the deceased, building memorials, tombs, statues, monuments and other figures to commemorate the life of the deceased, and carrying out a series of ceremonies and/or rituals in remembrance. From this cultural practice, African Traditional Spirituality is not exempt. Now that we’ve established that this practice isn’t as foreign as we’d like to believe, it’s important to acknowledge that all deceased are not created equally. Criteria for ancestor designation is that the deceased lived a righteous life through which the Creator and the community were served. It’s not uncommon for people across all faiths to hold the belief that items left by the deceased contain good will or protection, this too is a form of veneration. 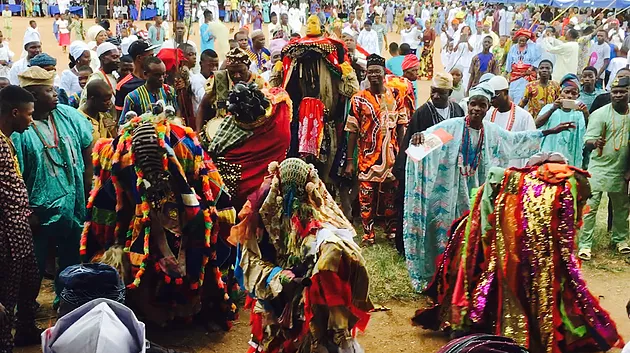 In IAS, ancestors are commonly honored through large ceremonies known as masquerades and/or festivals. We see examples of this all around the world, from Chinese New Year, to Mardi Gras, to the Day of the Dead. Ceremonies often include masks or costumes which are thought to represent various ancestors and deities, large feasts in celebration of family and community, and devotion at temples, altars, or shrines. It’s important that we acknowledge that IAS offers an autonomy that other faiths are incapable of offering. Why? Because IAS not governed by a written text and therefore offers its followers room to interpret, express, grow and connect as they see fit. How one follower interacts with their ancestors has no bearing on how their neighbor may choose to interact. It’s safe to say Myth #3 is true. IAS gets the short end of the “tree hugger’ stick. Most depictions show followers bowing and praying to non-human objects, trees, rivers, cows, you name it. A concept known as animism which touts the belief that everything has a consciousness, a spirit, a soul even. Not only has this association played a huge part in how indigenous spirituality is perceived globally but also how it’s followers are treated. The second static concept amongst Indigenous African spiritual systems is the belief in a reciprocal relationship between mankind and nature. There is an undeniable emphasis on respect, balance, and mutuality. There has long existed a oneness with nature promoted through the practices of indigenous spirituality, the belief that nature will nurture and provide if she be treated with love and respect. Early travelers tell stories of a people so skilled in agronomy, horticulture and aquaculture that their abilities were thought to be magic. It is only through the trauma of the Transatlantic slave trade that we see it’s descendants shy away from this attachment to nature. We hear endless accounts detailing how nature became weaponized against the enslaved, babies used as gator feed, maimed bodies swinging from hundred-year-old trees. The result being a culture wide aversion to nature. It’s totally common to hear African Americans joke about camping, fishing and other outdoor activities being primarily for white people. How many of our friends dress up for the pool party because swimming simply isn’t an option. Dodging the sun to avoid getting darker is so common that Black Americans are dealing with a Vitamin d deficiency in numbers previously unheard of. The undeniable trauma of slavery dwells within the subconscious minds of its descendants and reinforces the disconnect we see today, causing us to mischaracterize a perfectly natural relationship between living things. The relation between indigenous spirituality and nature is one that centers on constructive coexistence and judging by the state of nature around the world, we could all stand to learn a thing or two from IAS. This myth is 100% false. IAS consistently places emphasis on the balance of masculine and feminine energies and the divinity of the two. Oral tradition highlights the importance of protecting both energies to create and maintain harmony within the universe. The presentation of a masculine entity, energy, or principle is always accompanied by its equal feminine counterpart. The Dogon people of West Africa, a civilization dating as far back as 3,000BC, demonstrate this belief through the Creator, Amma, who is often depicted as fraternal twins. The Bantu-Kongo people of the Kongo kingdom, a prominent central African state during the medieval era, believed God to possess one body, male on the right side and female on the left side. The indigenous African approach to gender has always been one of the complimentary nature, not the competitive. With Humanism as its third and final link, it should come as no surprise that IAS teaches that the oppression of one group automatically results in the oppression of the entire community. Unlike many of the dominant religions, IAS boasts no shortages of female divinities, goddesses, diviners, medicine women, practitioners, priestesses, and principalities, all having equal representation and importance within the culture. I know that you didn’t think the concept of gender equity came out of the Western world. This one too, also false. 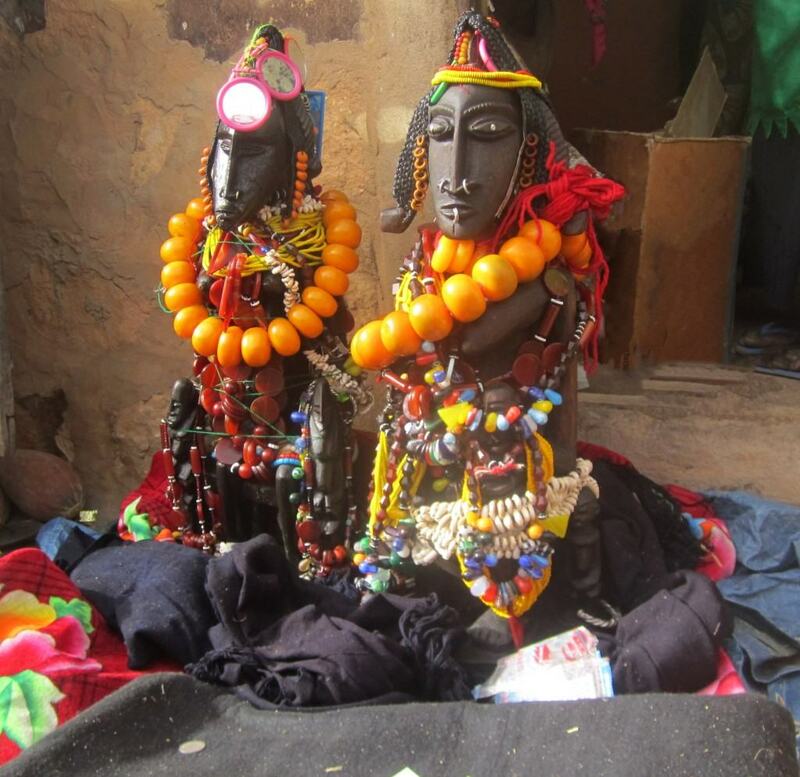 Deriving from a spiritual system known as Vodun, Voodoo has its earliest origins in some of the most heavily trafficked regions of West Africa during the slave trade, modern day Togo, Ghana and Benin. 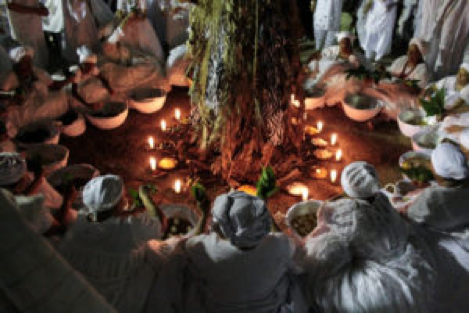 Often referred to as the “World’s Oldest Religion”, Vodun is a monotheistic practice, centering around the divinity of creation and the balance between masculine and feminine energy, as seen in the Divine Creator who is depicted as both moon and sun, male and female. 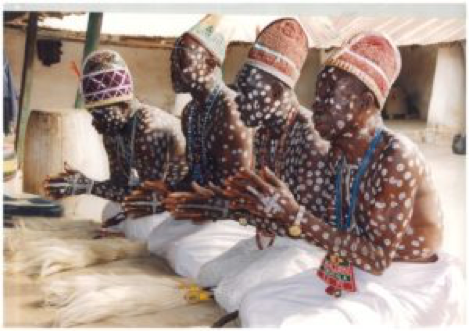 Vodun intertwined with the everyday lives of its followers, guiding most other aspects of the culture including agriculture, treatment of animals, education, community relations, compassion for the living life and veneration of the dead, cosmology, and health and healing. We see traces of Vodun across various destinations of the Transatlantic slave route. Vodou in Haiti, Vudú in the Dominican Republic, Vodú in Cuba, Vodum in Brazil and Voodoo in Louisiana. Each variation taking on some aspect of the dominant religion. Despite the peaceful core of Vodun and its offshoots, the West’s portrayal of its practices have always been rooted in fear and indignation. Although Voodoo is credited with the success of the Haitian Revolution that drove the French from the island of Haiti, much of the battle id told from the perspective of the losers. Wealthy French plantation owners forced to flee to Louisiana, bringing their Haitian house help with them, came telling tales of human sacrifice, animal beheadings, and fiery, trans inducing drum circles. Forcing the many followers of Voodoo living in the Southeast region of the country to live in secrecy. Imagine if we reduced Christianity to the weekly ritual of filing into a temple to consume the artificial blood and flesh of a deceased prophet, Christians around the world would be forced to fight labels like cannibal and savage and hide their practices from the misinformed public. Which is something more than 50 million global followers of Vodun deal with daily. It’s important to connect the dots between Voodoo and IAS, but it’s equally important to address the roots of their unearned reputations. Excusing the designation of dark practice, #6 is true. Exploring the indigenous spiritual system of my people has been one of the most powerful and liberating experiences of my life. I discovered that I too held firmly to many of the misconceptions perpetuated about IAS and my mother continent in general. For the first time as an adult, I made educating myself my own responsibility. And despite the challenges and the frustrations, I found myself in the spirituality of my ancestors. It’s important that we recognize our position as global citizens and approach new or foreign concepts with an open-mind, one devoid of entitlement, judgement and fear. As we witness the descendants of enslaved Africans make the conscious decision to reconnect with the beautiful and robust cultures once stripped from them, it’s important that we encourage and uplift one another through our journeys to self-discovery. Not because we are all the same, but because our differences are what magnify our value. My people, the Igbo’s of Southeast Nigeria, have a saying, “egbe bere ugo bere” (let the eagle perch, let the hawk perch). One thing is for sure, there’s room for us all.